It's about that time. 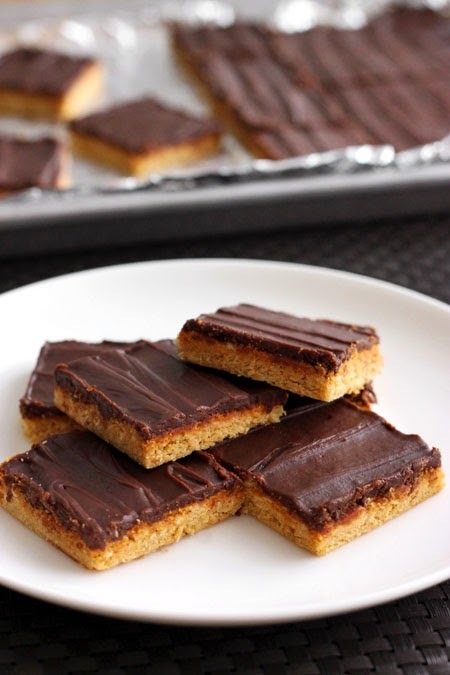 And if you're thinking "Peanut Butter-Chocolate" time, then you'd be right. I never liked peanut butter as a kid. My mom used to threaten me with peanut butter and jam sandwiches for lunch when I gave her an obnoxious "I don't care" answer to her question, "What do you want for lunch tomorrow?" My answer quickly changed to "proscuitto sandwich please". I must've been going through a phase. I'm sorry Mom - thank you for packing my school lunch every single day, and for writing loving messages to me via banana peel! I eventually grew up and learned to love peanut butter. Green apple + peanut butter is crazy delicious no matter how many strange looks I get in the lunch room. Don't knock it 'till you try it - that's what I say. 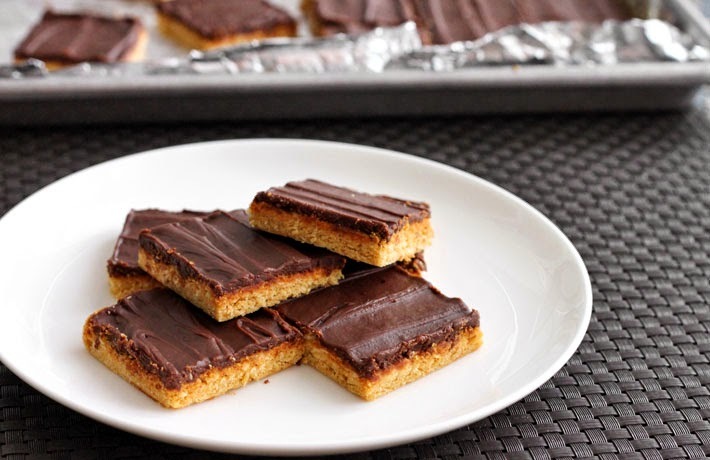 These thin squares are a killer lunchbox treat. Imagine dessert meets granola bar... that's what kind of territory we're in here. We need to spread this dough out thinly into the base of a cookie tray and bake the whole thing like one giant rectangular cookie. While it's still warm we can spread peanut butter evenly over it. It will melt slightly, making it easier to spread. Once this cools we can make the fudge layer. Chocolate + butter + cocoa + icing sugar + salt. Fudge, we all know, is super sweet. The added cocoa and salt helps to balance this faux-fudge so that it has a prominent chocolate taste. Don't be too fussy when it comes to spreading it out because the more you move it around, the faster it will cool and set, and the higher the risk of developing a grainy texture. An offset spatula is the best tool for this, or for spreading anything evenly for that matter, and for frosting cakes and cupcakes too! It's sometimes called a palette knife and it makes the professional look come easy. Go get one. Preheat oven to 350 degrees F. Line a 13x9-inch rimmed baking tray with parchment paper. Combine flour, salt, baking soda and oats in a bowl and whisk to blend evenly. In the bowl of an electric stand mixer fitted with the paddle attachment, cream together butter with both sugars on medium-high speed until pale and fluffy, about 3-4 minutes. Mix in peanut butter. Beat in egg and vanilla until well combined. With mixer on low speed, slowly add dry ingredients and mix until combined. Spread mixture into an even layer into prepared tray (it will be fairly thin once spread). Bake for 13-15 minutes, or until lightly golden. Remove from oven and let cool for 5 minutes before spreading remaining 2/3 cup of peanut butter evenly over the baked base. The peanut butter will become easier to spread as it melts from the heat of the base. Set aside. For the chocolate frosting, combine butter, chocolate, cocoa and 2 tablespoons of milk in a small saucepan over medium-low heat and stir until it comes to a boil. Once the mixture reaches a boil, remove from heat and stir in vanilla extract. Sift in powdered sugar and whisk until well blended. If mixture is too thick, whisk in 1 more tablespoon of milk. It should be thick but pourable like hot fudge. 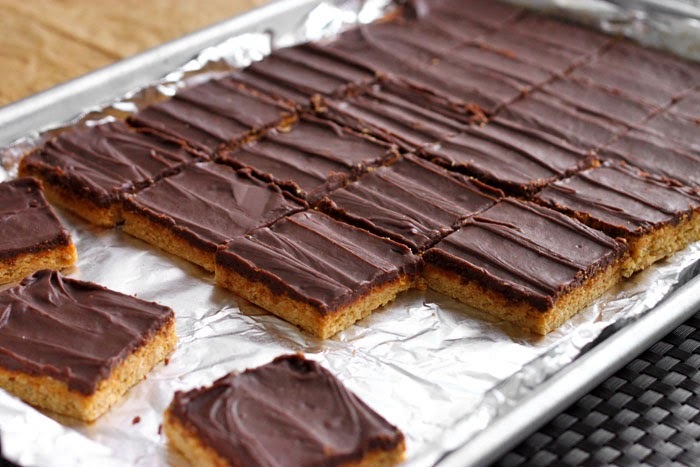 Immediately pour frosting over peanut butter layer and spread into an even layer (Note, the frosting sets quickly so work quickly at this point). Store in an airtight container at room temperature. That's so cute that your mom would write messages on a banana peel for you! I might have to steal that idea when my kids are school aged and I pack their lunches. 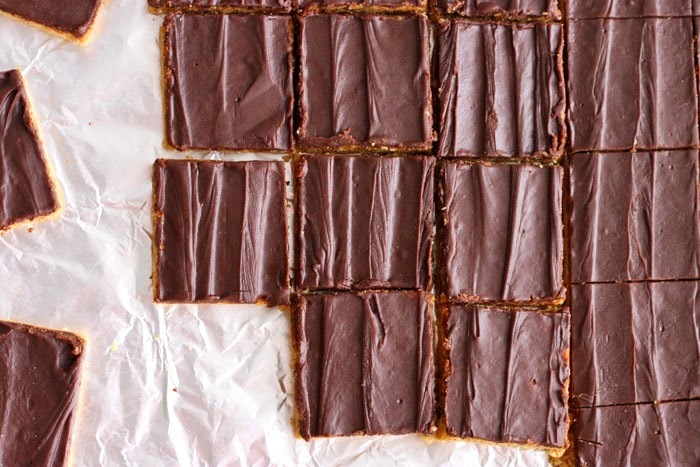 In the meantime, these Chocolate Peanut Butter Bars look crazy good! I can't wait to try them! i love chocolate and pb!